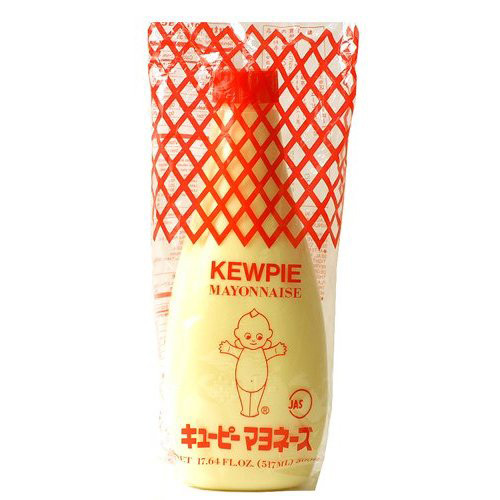 Because of these setbacks, Kewpie mayo takes some getting used to. Now that I've come to terms with the unsettling packaging, I've probably topped about a dozen sandwiches with the stuff now. Its performance has by and large been excellent. At worst, the mayo's presence has gotten lost among the other sandwich toppings. At best — and this has been the norm — the mayo elevates even boring sandwiches to lofty heights. So far, my favorite sandwich combo has been a Boar's Head Salsalito turkey sandwich with Muenster cheese, Kraft yellow mustard and the Kewpie mayo on Stroemann potato bread. The bite of the mustard and the spicy turkey helped to cut and compliment the savory mayo and cheese. This came as no surprise given mustard and mayo's long standing partnership. Another good combo was a hot breaded chicken patty with Kewpie mayo and Bulldog tonkatsu sauce on a white hamburger bun. The mayo didn't fare quite as well on ham or pastrami sandwiches, but I don't usually put mayo on those anyway. I only tried the combo for the sake of science, and because the packaging recommended using the mayo within a month of opening it. That last point is worth noting — I tried to use it all up within a month, but I'm just one man and my girlfriend doesn't like mayo. I'm guessing even the most ardent mayo eater would have a hard time taking down all 17.64 ounces that quickly. I bought the Kewpie mayo about two months ago, so I'm living on borrowed time now. I haven't noticed any deterioration in its quality, so I'm going to keep using it anyway. I'll update the blog if it ends up poisoning me. If I was ever going to try mayo I would try this one based on this blog alone! I'm sure I've had it unknowingly in sauces and I bet I've liked those sauces very much. I would certainly use it as an ingredient ;) I'm glad you're enjoying it though and getting a lot of use out of it. Also, those commercials are creepy! What's so disturbing about the packaging? It's just a Kewpie doll! I would argue that Kewpie dolls are inherently disturbing. Maybe I've seen too many horror films. I'm also not 100% comfortable with the idea of mayo coming in a bag. Side note: Can anyone explain what's going on with the doll's shoulders? Is she wearing earrings? japanese put kewpie mayo on their yakisoba (stir-fried noodles), and it tastes divine. Interesting, that does sound good. Since posting this I have grown to love this stuff and eat it on my sandwiches every week. What came first? The Kewpie doll or the Kewpie mayo? I just saw this mayo in the store today and then did a google search about for "naked baby mayonnaise" and found this post. LOL! What is a Kewpie anyway? According to Wikipedia and the Kewpie mayo website, the dolls came from a 1909 comic strip and the mayo company was formed in 1919. It says Kewpies are based on Cupid and were "extremely popular in the early twentieth century." I think they're creepy looking ... I wonder if anyone else did at the height of their popularity. Best Foods/ Hellman's is the Mt. Everest of Mayo. There is no use buying some samurai sandwich version of the best mayo available. No way, no how. I will not be eating any kewpie doll bagged mayo anytime soon. Fair enough, sir. We all have our own sandwich choices to make in life. I'll admit would make my life easier to return to Hellman’s, given I only have one squirt of bagged mayo left and now have to trek over to a Japanese market this weekend or risk eating dry sandwiches next week. First discovered this while I was living in Japan, I call it Creepy Baby and its the only mayo I use.